Two new Aygo’s ready for the summer! Two new Aygo's ready for the summer! The ever popular Toyota Aygo is getting a refresh this summer, with two new versions of the city car set to hit the road. 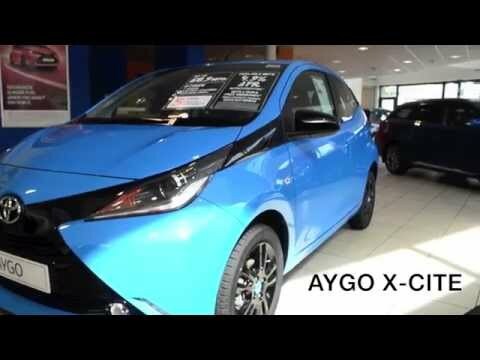 Firstly, the Aygo x-cite. This car follows the same theme as the original x-cite model but the bold Orange Twist paintwork has been replaced with Cyan Splash. The bright blue metallic bodywork perfectly contrasts the gloss black features on the car, including the 15-inch alloy wheels, front X and door mirror castings. The Cyan Blue continues throughout the car's interior and is featured on the air vent surrounds and carpet mat edging. The blue also contrasts the dark grey finish on the seats. The new x-cite is fully equipped with the x-touch multimedia system which includes Bluetooth, DAB and a reversing camera. The car is available as a three or five door, in manual or automatic, powered by a one litre engine. And then there's the Aygo x-pure. The exterior has White Flash paintwork and includes rear privacy glass, white painted alloys and silver finished elements to the bodywork. Inside the cabin the grey seats are complimented by white and light grey features. The x-pure is also fully equipped with the x-touch multimedia system, which includes Bluetooth, DAB and reversing cameras. If you are interested in either of these cars, contact us at Chiswick, Kingston or Twickenham for more information about how you could be driving the new Aygo around this summer.